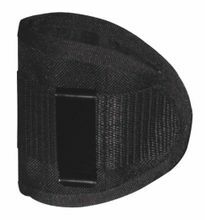 Nylon Inside the Pants Holster for Medium Auto handguns. Inside the Pants Holster - Minimalist design Ambidextrous holster for either left and right handed use Spring steel removable clip allows for use with any standard-width pants belt Light weight durable nylon material Fits a variety of Airsoft pistols and revolvers Inside the pants for the utmost in comfort and concealment Open top for fast access, no retention at all, just the holster and gravity. Smooth soft lining for easy draw. Fits medium handguns like the Taurus/Beretta 92F (no rails).